This is the first new kidney stone management system in 30 years. It's a revolutionary treatment. NASA funded us to invent this technology that can, with the transducer probe pressed up against the skin, use the sound wave force to push stones, and to direct their movement out of the kidney. This new treatment is non-invasive and powered by focused ultrasound, providing safe, timely management of kidney stones on Earth and, very soon, in space. Tractor beam doesn’t sound very scientific  it sounds like science fiction. But these acoustic waves can be focused and shaped to build a cage of pressure around the stone. We’re working on a complicated system in the lab to make the acoustic beams and also getting straight to the clinic and trying this with the existing system we’ve built that can push, break, and image stones. Astronauts have a higher risk of developing kidney stones because of the microgravity environment. They can put an astronaut out of commission or be life-threatening. We have to develop a capability that does not require surgery, a urologist, or ionizing radiation. Ultrasound fits the bill. This research is developing a new ultrasound device to detect, size, fragment, and expel kidney stones. Stone Detection + Sizing (S-Mode). Our B-Mode ultrasound imaging has been customized to enhance stone contrast with surrounding tissue. In addition, we have optimized the Doppler 'twinkling' to aid in the detection of kidney stones. Stone Targeting + Repositioning. The same ultrasound probe that is used for imaging is used to reposition kidney stones and stone motion is monitored with B-mode in real time. Burst Wave Lithotripsy (BWL). We are investigating a new mechanism for stone fragmentation. Burst waves of lower pressure than shockwaves can be used to break stones into barticles < 2 mm. Treatments could potentially be faster and with less injury than ESWL. This dedicated ultrasound system is capable of non-invasive, real-time, image-guided repositioning of kidney stones. We can move stones while patients are awake so there’s no pain  this can be an office procedure. The real goal is to relocate small stones to facilitate their passage. This is completely novel technology. There’s nothing like it out there. 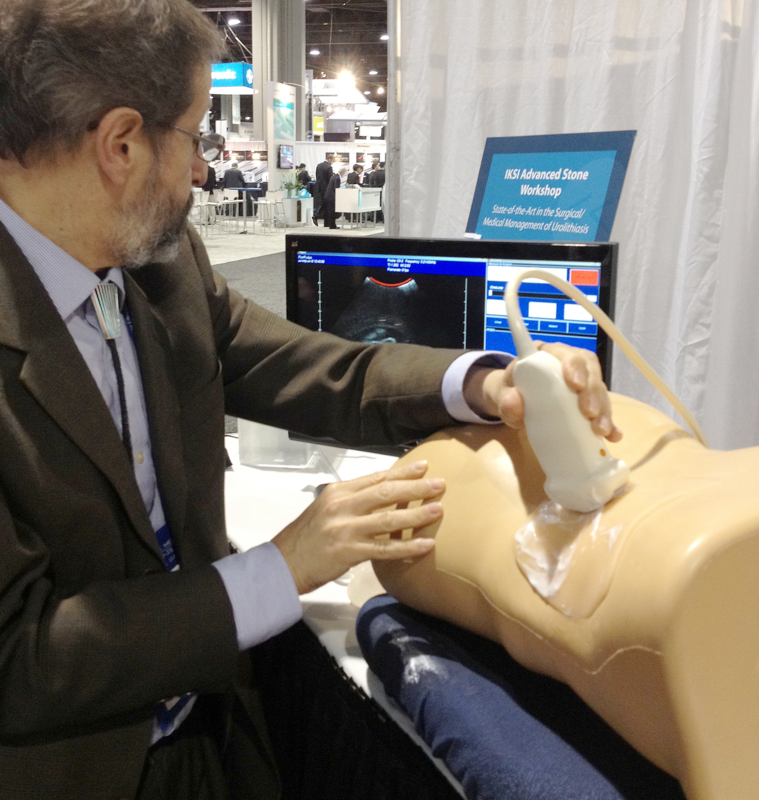 In almost every clinical trial patient, we could reposition stones with ultrasound. In one dramatic case, small stones were actually passed within hours of the study treatment. Subjects underwent ultrasonic propulsion while awake without sedation in clinic, or during ureteroscopy while anesthetized. Kidney stones were repositioned in 14 of 15 subjects. Ultrasonic propulsion was able to successfully reposition stones and facilitate the passage of fragments in humans. No adverse events were associated with the investigational procedure. Harper, J.D., et al., J. Urol. 195, 956-964, doi:10.1016/j.juro.2015.10.131, 2016. R. Kelsey, Nature Rev. Urol. 13, doi:doi:10.1038/nrurol.2015.281, 2015. May, P.C., M.R. Bailey, and J.D. Harper, Current Opinion in Urol. 26, 264-270, doi:10.1097/MOU.0000000000000276, 2016. From Harper et al., J. Urol., 195, 956-964, 2016. How can you conduct basic research and clinical trials? At one point we too looked at clinical trials as a final demonstration. However, more commonly they are a tool in the iterative process to refine and validate a technology for clinical use. In particularly, each new 'claim' needs to be justified for regulatory approval and then validated in a clinical trial. We are interested in expanding the claims related to relieving pain from an obstructing stone, to moving many stone fragments, to operating in conjunction with SWL, and more. How is the clinical trial going? The successful results of our first trial were published in April 2016 in the Journal of Urology. We hope to start our second and third trials in August 2016. Are you moving stones in the ureter? In the first trial we expelled stones from the kidney to the ureter, from where they passed naturally. We also moved a stone too large to pass through the ureter back into the kidney and measured immediate pain relief. In our next clinical trial we will study moving stones in the ureter to relieve pain. Does it matter stone shape or type? Mostly we are concerned about size and do not always have information on stone shape or composition. In vivo and in vitro we have moved all types. We have had subjects pass sharp fragments post SWL or URS, which is the intended way SWL and URS work. Can you clean out small stones or fragments? Our 3rd trial will focus on expelling fragments left over after stone surgery. All surgeries leave fragments and many of these do not pass from the kidney. In the first trial we moved fragments in all 6 subjects (2 who had had shock wave lithotripsy, 32 who had had ureteroscopy and laser lithotripsy , and 2 who had had both) and 4 of these subjects passed over 30 fragments collectively. I see you are also doing research on detecting and sizing kidney stones with ultrasound. Please address these issues: How do you co-register your imaging modalities? We use one probe for all imaging and therapy. All modes are therefore self-registering. How do you deal with breathing motion? In moving stones or imaging if respiratory motion is a problem we ask the patient to breathe in a prescribed way to hold his or her breath. Have you reported data in humans of improved detection? Yes. Please see Sorensen et al., Endourology, 2012, linked below. And we have other publications in review. In addition, in the first trial of ultrasonic propulsion, clinical imaging reported 4 subjects who had stones too large to pass, but when we pushed on the stones we found they were instead a collection of small fragments, which those subjects then passed. So ultrasonic propulsion has a diagnostic role too. Have you presented your most recent imaging work? Our paper on stone sizing was on the cover of the January 2016 issue of the Journal of Urology and we have other publications in review. Sorensen, M.D., M.R. Bailey, A.R. Shah, R.S. Hsi, M. Paun, and J.D. Harper, "Quantitative assessment of shock wave lithotripsy accuracy and the effect of respiratory motion," J. Endourology, 26, 1070-1074, doi:10.1089/end.2012.0042, 2012. Effective stone comminution during shock wave lithotripsy (SWL) is dependent on precise three-dimensional targeting of the shock wave. Respiratory motion, imprecise targeting or shock wave alignment, and stone movement may compromise treatment efficacy. The purpose of this study was to evaluate the accuracy of shock wave targeting during SWL treatment and the effect of motion due to respiration. Methods: Ten patients underwent SWL for the treatment of 13 renal stones. Stones were targeted fluoroscopically using a Healthtronics Lithotron (5 cases) or Dornier Compact Delta II (5 cases) shock wave lithotripter. Shocks were delivered at a rate of 1-2Hz with ramping shock wave energy settings of 14-26kV or level 1-5. After the low energy pre-treatment and protective pause, a commercial diagnostic ultrasound imaging system was used to record images of the stone during active SWL treatment. Shock wave accuracy, defined as the proportion of shock waves that resulted in stone motion with shock wave delivery, and respiratory stone motion were determined by two independent observers who reviewed the ultrasound videos. Results: Mean age was 51±15 years with 60% males and mean stone size was 10.5±3.7 mm (range 5-18 mm). A mean of 2675±303 shocks were delivered. Shock wave-induced stone motion was observed with every stone. Accurate targeting of the stone occurred in 60±15% of shock waves. Conclusions: Ultrasound imaging during SWL revealed that 40% of shock waves miss the stone and contribute solely to tissue injury, primarily due to movement with respiration. These data support the need for a device to deliver shock waves only when the stone is in target. Ultrasound imaging provides real-time assessment of stone targeting and accuracy of shock wave delivery. Ten healthcare technologies that have come from space include a hand-held ultrasound system to detect, move, and pulverize kidney stones. Mike Bailey led a team to develop a system to avoid surgical procedures often associated with kidney stone disease. Using long pulses of sound waves, smaller stones are pushed from the kidney safely without anesthesia. With help from a grant from the National Space Biomedical Research Institute (a NASA-funded group), the team is developing a handheld ultrasound device that can detect and pulverize kidney stones  without surgery or bulky equipment. 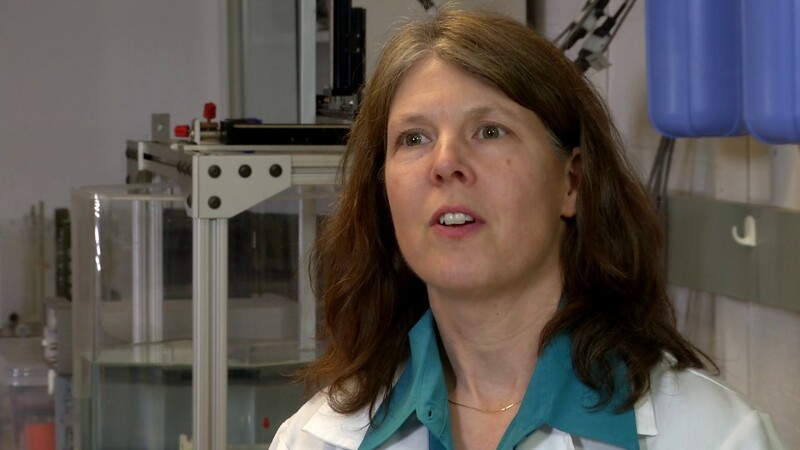 Two new technologies developed by University of Washington researchers could bring noninvasive relief to such patients. 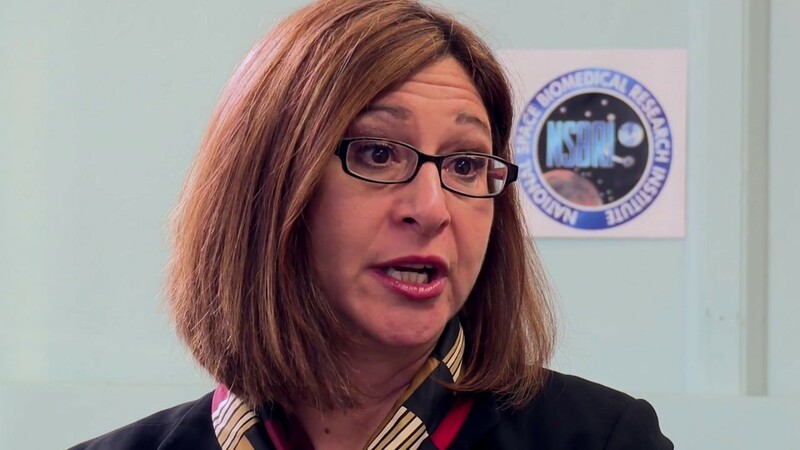 Ultrasonic detection, breaking, and propulsion of kidney stones is discussed by Dorit Donoviel, Deputy Chief Scientist at the National Space Biomedical Research Institute. The research led by APL-UW's Mike Bailey is showcased as an example of how engineering solutions for future long space voyages is improving health here on Earth right now. A new device developed at the University of Washington would let doctors use ultrasound to move kidney stones inside the body and help them pass by natural means. Dai, J.C., B. Dunmire, K.M. Sternberg, Z. Liu, T. Larson, J. Thiel, H.C. Chang, J.D. Harper, M.R. Bailey, M.D. Sorensen, "Retrospective comparison of measured stone size and posterior acoustic shadow width in clinical ultrasound images," World J. Urol., 36, 727-732, doi:10.1007/s00345-017-2156-8, 2018. Posterior acoustic shadow width has been proposed as a more accurate measure of kidney stone size compared to direct measurement of stone width on ultrasound (US). Published data in humans to date have been based on a research using US system. Herein, we compared these two measurements in clinical US images. Thirty patient image sets where computed tomography (CT) and US images were captured less than 1 day apart were retrospectively reviewed. Five blinded reviewers independently assessed the largest stone in each image set for shadow presence and size. Shadow size was compared to US and CT stone sizes. Eighty percent of included stones demonstrated an acoustic shadow; 83% of stones without a shadow were ≤5 mm on CT. Average stone size was 6.5 ± 4.0 mm on CT, 10.3 ± 4.1 mm on US, and 7.5 ± 4.2 mm by shadow width. On average, US overestimated stone size by 3.8 ± 2.4 mm based on stone width (p < 0.001) and 1.0 ± 1.4 mm based on shadow width (p < 0.0098). Shadow measurements decreased misclassification of stones by 25% among three clinically relevant size categories (≤ 5, 5.110, > 10 mm), and by 50% for stones ≤ 5 mm. US overestimates stone size compared to CT. Retrospective measurement of the acoustic shadow from the same clinical US images is a more accurate reflection of true stone size than direct stone measurement. Most stones without a posterior shadow are ≤ 5 mm. Rosnitskiy, P.B., B.A. Vysrokanov, L.R. Gavrilov, O.A. Sapozhnikov, and V.A. Khokhlova, "Method for designing multi-element fully populated random phased arrays for ultrasound surgery applications," IEEE Trans. Ultrason. Ferroelectr. Freq. Control, 65, 630-637, doi:10.1109/TUFFC.2018.2800160, 2018. Maximizing the power of multi-element phased arrays is a critical factor for high intensity focused ultrasound (HIFU) applications such as histotripsy and transcostal sonications. This can be achieved by a tight packing of the array elements. Good electronic focusing capabilities are also required. Currently used quasi-random arrays with a relatively low filling factor of about 60% have this focusing ability. Here, a novel method of designing random HIFU arrays with the maximum possible filling factor (100% if no gaps between elements needed in practice are introduced) and polygonal elements of equal area and slightly different shape based on the capacity-constrained tessellation is described. The method is validated by comparing designs of two arrays with the same geometric and physical parameters: an existing 256-element array with a compact 16-spirals layout of circular elements and the proposed array with the maximum possible filling factor. Introduction of a 0.5 mm gap between the elements of the new array resulted in a reduction of its filling factor to 86% as compared with 61% for the spiral array. It is shown that for the same intensity at the elements, the proposed array provides two times higher total power while maintaining the same electronic focusing capabilities as compared to the spiral one. Furthermore, the surface of the capacity-constrained tessellation array, its boundary, and a central opening can have arbitrary shapes. Simon, J.C., O.A. Sapozhnikov, W. Kreider, M. Breshock, J.C. Williams Jr., and M.R. Bailey, "The role of trapped bubbles in kidney stone detection with the color Doppler ultrasound twinkling artifact," Phys. Med. Biol., 63, 025011, doi:10.1088/1361-6560/aa9a2f, 2018. The color Doppler ultrasound twinkling artifact, which highlights kidney stones with rapidly changing color, has the potential to improve stone detection; however, its inconsistent appearance has limited its clinical utility. Recently, it was proposed stable crevice bubbles on the kidney stone surface cause twinkling; however, the hypothesis is not fully accepted because the bubbles have not been directly observed. In this paper, the micron or submicron-sized bubbles predicted by the crevice bubble hypothesis are enlarged in kidney stones of five primary compositions by exposure to acoustic rarefaction pulses or hypobaric static pressures in order to simultaneously capture their appearance by high-speed photography and ultrasound imaging. On filming stones that twinkle, consecutive rarefaction pulses from a lithotripter caused some bubbles to reproducibly grow from specific locations on the stone surface, suggesting the presence of pre-existing crevice bubbles. Hyperbaric and hypobaric static pressures were found to modify the twinkling artifact; however, the simple expectation that hyperbaric exposures reduce and hypobaric pressures increase twinkling by shrinking and enlarging bubbles, respectively, largely held for rough-surfaced stones but was inadequate for smoother stones. Twinkling was found to increase or decrease in response to elevated static pressure on smooth stones, perhaps because of the compression of internal voids. These results support the crevice bubble hypothesis of twinkling and suggest the kidney stone crevices that give rise to the twinkling phenomenon may be internal as well as external. Simon, J.C., B. Dunmire, M.D. Sorensen, and M.R. 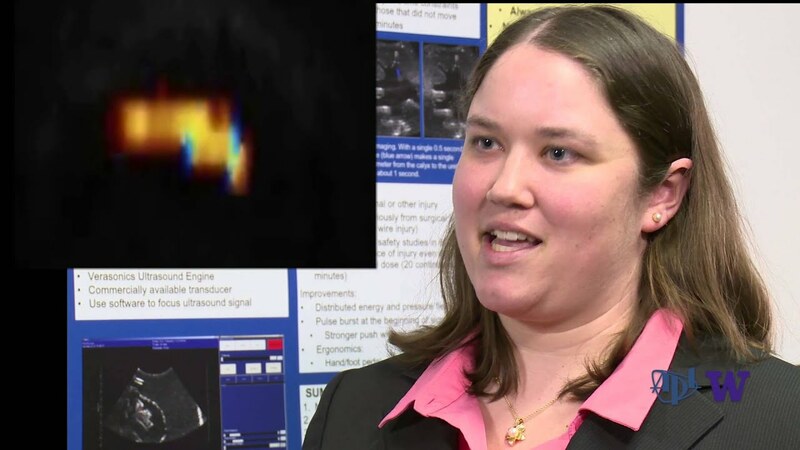 Bailey, "Developing complete ultrasonic management of kidney stones for spaceflight," J. Space Safety Eng., 3, 50-57, 2016. Bone demineralization, dehydration, and stasis put astronauts at an increased risk of forming kidney stones in space. The incidence of kidney stones and the potential for a mission-critical event are expected to rise as expeditions become longer and immediate transport to Earth becomes more problematic. At the University of Washington, we are developing an ultrasound-based stone management system to detect stones with S-modeTM ultrasound imaging, break stones with burst wave lithotripsy (BWLTM), and reposition stones with ultrasonic propulsion (UPTM) on Earth and in space. This review discusses the development and current state of these technologies, as well as integration on the flexible ultrasound system sponsored by NASA and the National Space Biomedical Research Institute. Lee, F.C., R.S. Hsi, M.D. Sorensen, M. Paun, B. Dunmire, Z. Liu, M. Bailey, and J.D. Harper, "Renal vasoconstriction occurs early during shockwave lithotripsy in humans," J. Endourol., 29, 1392-1395, doi:10.1089/end.2015.0315, 2015. In animal models, pretreatment with low-energy shock waves and a pause decreased renal injury from shockwave lithotripsy (SWL). This is associated with an increase in perioperative renal resistive index (RI). A perioperative rise is not seen without the protective protocol, which suggests that renal vasoconstriction during SWL plays a role in protecting the kidney from injury. The purpose of our study was to investigate whether there is an increase in renal RI during SWL in humans. Subjects were prospectively recruited from two hospitals. All subjects received an initial 250 shocks at low setting, followed by a 2-minute pause. Treatment power was then increased. Measurements of the renal RI were taken before start of procedure, at 250, after 750, after 1500 shocks, and at the end of the procedure. A linear mixed-effects model was used to compare RIs at the different time points. Fifteen patients were enrolled. Average treatment time was 46±8 minutes. Average RI at pretreatment, after 250, after 750, after 1500 shocks, and post-treatment was 0.67±0.06, 0.69±0.08, 0.71±0.07, 0.73±0.07, and 0.74±0.06, respectively. In adjusted analyses, RI was significantly increased after 750 shocks compared with pretreatment (p=0.05). Renal RI increases early during SWL in humans with the protective protocol. Monitoring for a rise in RI during SWL is feasible and may provide real-time feedback as to when the kidney is protected. Khokhlova, V.A., P.V. Yuldashev, W. Kreider, O.A. Sapozhnikov, M.R. Bailey, T.D. Khokhlova, A.D. Maxwell, and L.A. Crum, "Addressing nonlinear propagation effects in characterization of high intensity focused ultrasound fields and prediction of thermal and mechanical bioeffects in tissue," J. Acoust. Soc. Am., 134, 4153, doi:10.1121/1.4831221, 2013. Nonlinear propagation effects are present in most fields generated by high intensity focused ultrasound (HIFU) sources. In some newer HIFU applications, these effects are strong enough to result in the formation of high amplitude shocks that actually determine the therapy and provide a means for imaging. However, there is no standard approach yet accepted to address these effects. Here, a set of combined measurement and modeling methods to characterize nonlinear HIFU fields in water and predict acoustic pressures in tissue is presented. A characterization method includes linear acoustic holography measurements to set a boundary condition to the model and nonlinear acoustic simulations in water for increasing pressure levels at the source. A derating method to determine nonlinear focal fields with shocks in situ is based on the scaling of the source pressure for data obtained in water to compensate for attenuation losses in tissue. The accuracy of the methods is verified by comparing the results with hydrophone and time-to-boil measurements. Major effects associated with the formation of shocks are overviewed. A set of metrics for determining thermal and mechanical bioeffects is introduced and application of the proposed tools to strongly nonlinear HIFU applications is discussed. Lu, W., O.A. Sapozhnikov, M.R. Bailey, P.J. Kaczkowski, and L.A. Crum, "Evidence for trapped surface bubbles as the cause for the twinkling artifact in ultrasound imaging," Ultrasound Med. Biol., 39, 1026-1038, doi:10.1016/j.ultrasmedbio.2013.01.011, 2013. The mechanism of the twinkling artifact (TA) that occurs during Doppler ultrasound imaging of kidney stones was investigated. The TA expresses itself in Doppler images as time-varying color. To define the TA quantitatively, beam-forming and Doppler processing were performed on raw per channel radio-frequency data collected when imaging human kidney stones in vitro. Suppression of twinkling by an ensemble of computer-generated replicas of a single radio frequency signal demonstrated that the TA arises from variability among the acoustic signals and not from electronic signal capture or processing. This variability was found to be random, and its suppression by elevated static pressure and return when the pressure was released suggest that the presence of bubbles on the stone surface is the mechanism that gives rise to the TA. Rassweiler, J.J., T. Knoll, J.A. McAteer, J.E. Lingeman, R.O. Cleveland, M.R. Bailey, and C. Chaussy, "Shock wave technology and application: An update." Eur. Urol., 59, 784-796, doi:10.1016:/ju.eururo.2011.02.033, 2011. The introduction of new lithotripters has increased problems associated with shock wave application. Recent studies concerning mechanisms of stone disintegration, shock wave focusing, coupling, and application have appeared that may address some of these problems. To present a consensus with respect to the physics and techniques used by urologists, physicists, and representatives of European lithotripter companies. We reviewed recent literature (PubMed, Embase, Medline) that focused on the physics of shock waves, theories of stone disintegration, and studies on optimising shock wave application. In addition, we used relevant information from a consensus meeting of the German Society of Shock Wave Lithotripsy. Besides established mechanisms describing initial fragmentation (tear and shear forces, spallation, cavitation, quasi-static squeezing), the model of dynamic squeezing offers new insight in stone comminution. Manufacturers have modified sources to either enlarge the focal zone or offer different focal sizes. The efficacy of extracorporeal shock wave lithotripsy (ESWL) can be increased by lowering the pulse rate to 60-80 shock waves/min and by ramping the shock wave energy. With the water cushion, the quality of coupling has become a critical factor that depends on the amount, viscosity, and temperature of the gel. Fluoroscopy time can be reduced by automated localisation or the use of optical and acoustic tracking systems. There is a trend towards larger focal zones and lower shock wave pressures. New theories for stone disintegration favour the use of shock wave sources with larger focal zones. Use of slower pulse rates, ramping strategies, and adequate coupling of the shock wave head can significantly increase the efficacy and safety of ESWL. Kucewicz, J.C., B.W. Cunitz, B. Dunmire, M.R. Bailey, and L.A. Crum, "Autoregressive ultrasound imaging method to enhance kidney stone twinkling and suppress blood flow," J. Acoust. Soc. Am., 129, 2376, doi:10.1121/1.3587699, 2011. "Twinkling" is a widely reported ultrasound artifact whereby kidney stones and other similar calcified, strongly reflective objects appear as turbulent, flowing blood in color and power Doppler. The twinkling artifact has been shown to improve kidney stone detection over B-mode imaging alone, but its use has several limitations. Principally, twinkling can be confused with blood flow, potentially leading to an incorrect diagnosis. Here a new method is reported for explicitly suppressing the display of color from blood flow to enhance and/or isolate the twinkle signal. The method applies an autoregressive model to standard Doppler pulses in order to differentiate tissue, blood flow, and twinkling. The algorithm was implemented on a software-based, open architecture ultrasound system and tested by a sonographer on phantoms and on stones implanted in a live porcine kidney. Stones of 3-10 mm were detected reproducibly while suppressing blood flow in the image. In conclusion, a new algorithm designed to specifically detect stones has been tested and has potential clinical utility especially as efforts are made to reduce radiation exposure on diagnosis and monitoring. Shah, A., J.D. Harper, J.L. Wright, M.D. Sorensen, M. Paun, and M.R. Bailey, "Clinical assessment of shockwave lithotripsy accuracy," J. Acoust. Soc. Am., 129, 2376, doi:10.1121/1.3587696, 2011. Kidney stone movement primarily due to patient respiration compromises shock wave lithotripsy (SWL) targeting and efficacy. The objective of this study is to describe the use of B-mode ultrasound to evaluate the accuracy of targeting during SWL. Patients undergoing electrohydraulic SWL were enrolled into this institutionally approved research study. A commercial diagnostic ultrasound imaging system, either Philips HDI 5000 or iU-22, was used to intermittently visualize and detect any shockwave-induced motion of the stone during 1-3 min periods. Four patients (mean age 52.7) underwent treatment of seven renal stones with mean individual stone size of 10.41 plus/minus 4.5 mm. A mean of 2937 shocks (range 2750-3000) were delivered at a rate of 1-2 Hz and charging voltage of 14-26 kV. Stone oscillation or jumping at the exact time of individual shock delivery was visualized with ultrasound: no stones completely failed to move. Accurate alignment, as interpreted by positive stone motion, occurred in a mean of 50 plus/minus 20.4% of shockwaves. 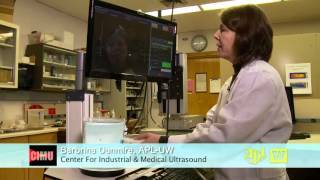 Ultrasound imaging represents a method of real-time assessment of accuracy in SWL and may provide the basis for devices to control targeting so that shockwaves are only delivered when the stone is in focus. Lu, W., B.W. Cunitz, O.A. Sapozhnikov, P.J. Kaczkowski, J.C. Kucewicz, N.R. Owen, M.R. Bailey, and L.A. Crum, "Investigation of the effect of signal amplitude on twinkling artifact," J. Acoust. Soc. Am., 129, 2376, doi: 10.1121/1.3587698, 2011. Twinkling artifact on color Doppler ultrasound is the color labeling of hard objects, such as kidney stones, in the image. 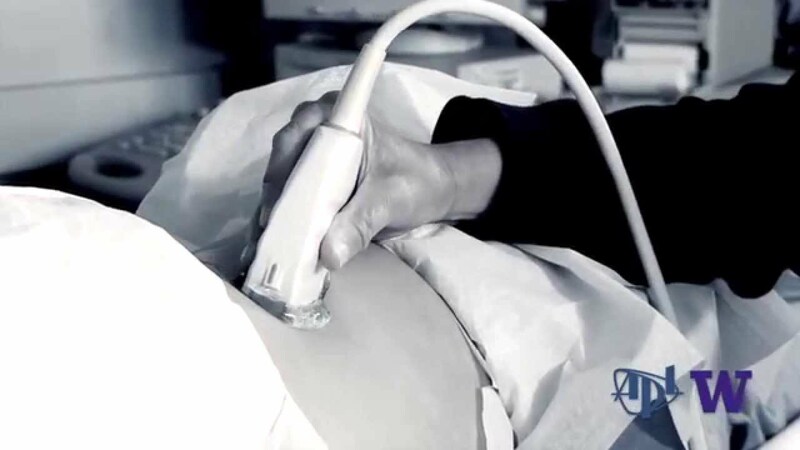 The origin of the artifact is unknown, but clinical studies have shown that twinkling artifact can improve the sensitivity of detection of stones by ultrasound. Although Doppler detection normally correlates changes in phase with moving blood, here the effect of amplitude on the artifact is investigated. Radio-frequency and in-phase and quadrature (IQ) data were recorded by pulse-echo ensembles using a software-programmable ultrasound system. Various hard targets in water and in tissue were insonified with a linear probe, and rectilinear pixel-based imaging was used to minimize beam-forming complexity. In addition, synthesized radio-frequency signals were sent directly into the ultrasound system to separate acoustic and signal processing effects. Artifact was observed both in onscreen and post-processed images, and as high statistical variance within the ensemble IQ data. Results showed that twinkling artifact could be obtained from most solid objects by changing the Doppler gain, yet signal amplitude did not have to be sufficiently high to saturate the receive circuits. In addition, low signal but high time gain compensation created the largest variance. Simon, J.C., O.A. Sapozhnikov, V.A. Khokhlova, T.D. Khokhlova, M.R. Bailey, and L.A. Crum, "Miniature acoustic fountain mechanism for tissue emulsification during millisecond boiling in high intensity focused ultrasound fields," J. Acoust. Soc. Am., 129, 2478, doi:10.1121/1.3588151, 2011. Feasibility of soft tissue emulsification using shock wave heating and millisecond boiling induced by high intensity focused ultrasound was demonstrated recently. 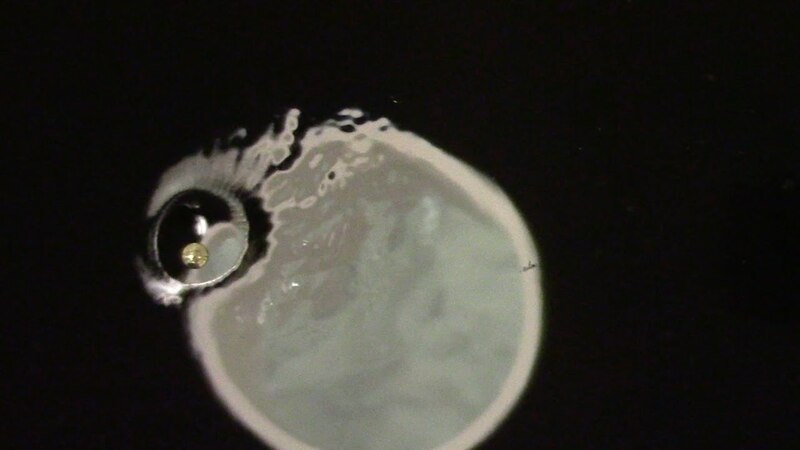 However, the mechanism by which the bubbles emulsify tissue is not well understood. High-speed photography of such exposures in transparent gel phantoms shows a milimeter-sized boiling bubble, and histological analysis in tissue samples reveals sub-micron-sized fragments. Here, a novel mechanism of tissue emulsification by the formation of a miniature acoustic fountain within the boiling bubble is tested experimentally using a 2 MHz transducer generating up to 70 MPa positive and 15 MPa negative peak pressures at the focus. The focus was positioned at or 1-2 mm off the plane interface between air and various materials including degassed water, transparent gel, thin sliced muscle tissue phantom, and ex-vivo tissue. Pulsing schemes with duty factors 0.001-0.1, and pulse durations 0.05-500 ms were used. Violent removal of micron-sized fragments and substantial displacement of the phantom surface were observed through high-speed filming. At the end of each exposure, the resulting erosion of the phantom surface and subsurface area was photographed and related to the exposure parameters. Sapozhnikov, O.A. and M.R. Bailey, "Modeling of radiation force imparted to an elastic sphere from an ultrasound beam of arbitrary structure," J. Acoust. Soc. Am., 129, 2377, doi:10.1121/1.3587700, 2011. The radiation force created by an acoustic wave incident on an elastic sphere is studied theoretically. Elastic spheres with properties similar to kidney stones are considered. An acoustic wave is taken in the form of a high-intensity focused ultrasound beam of megahertz frequency, which is typical for transducers proposed for stone therapy. To study radiation force of beams with arbitrary structure, the source excitation is modeled as a sum of plane waves of various inclinations (angular spectrum representation). First, a plane acoustic wave scattering at the stone is modeled using the known solution in the form of a spherical harmonics series. Then superposition of such solutions is used to calculate the scattered field from a focused beam. Once the acoustic field is known, the radiation stress tensor is calculated on a surface surrounding the sphere. Finally, the net force acting on the sphere is calculated by integrating the radiation stress along the surface. Numerical calculations show that the direction and value of the radiation force acting on the sphere depend on the pressure field structure in the region where the scatterer is positioned. Bailey, M.R., A.D. Maxwell, Y.A. Pishchalnikov, and O.A. Sapozhnikov, "Polyvinylidene flouride membrane hydrophone low-frequency response to medical shockwaves," J. Acoust. Soc. Am., 129, 2677, doi: 10.1121/1.3588971, 2011. Lithotripsy shockwaves are particularly difficult to measure because of their wide signal bandwidth and large pressures. A polyvinylidene fluoride (PVDF) membrane hydrophone and preamplifier were built and tested. A broad-focus electromagnetic lithotripter was used to calibrate the PVDF hydrophone. A fiber optic probe hydrophone (FOPH) with known impulse response was used as a measurement standard for secondary calibration. A low-frequency circuit model for the PVDF membrane electrodes in an infinite conductive medium was developed. The model response was compared with signals recorded by the FOPH and PVDF hydrophone at different levels of water conductivity ranging from 1 to 1300 microseconds/cm. Measured waveforms were distorted by high-pass filtering effects of the water conductivity. The model results showed good agreement with the measured waveforms and provided a correction for the system. When the input impedance was altered appropriately or the hydrophone was submerged in a nonconductive fluid, the PVDF and FOPH waveforms appeared nearly identical. The PVDF hydrophone is capable of measuring lithotripsy shockwaves accurately when the low-frequency response is properly taken into account. Illian, P.R., Jr., B.W. Cunitz, J.C. Kucewicz, M.R. Bailey, and P.J. Kaczkowski, "Real-time tracking of renal calculi displaced by the radiation force of focused ultrasound," J. Acoust. Soc. Am., 129, 2377, doi:10.1121/1.3587701, 2011. An area of active research involves using the radiation force of ultrasound to expel small kidney stones or fragments from the kidney. The goal of this work is real-time motion tracking for visual feedback to the user and automated adaptive pushing as the stone moves. Algorithms have been designed to track stone movement during patient respiration but the challenge here is to track the stone motion relative to tissue. A new algorithm was written in MATLAB and implemented on an open-architecture, software-based ultrasound system. The algorithm was first trained then implemented in real-time on B-mode IQ data recorded from phantom experiments and animal studies. The tracking algorithm uses an ensemble of image processing techniques (2-D cross-correlation, phase correlation, and feature-edge detection) to overlay color on the stone in the real-time images and to assign a color to indicate the confidence in the identification of the stone. Camera images as well as ultrasound images showed that the system was able to locate a moving stone, re-target, and apply a new focused push pulse at that location. Shah, A., N. Owen, W. Lu, B. Cunitz, P. Kaczkowski, J. Harper, M. Bailey, and L. Crum, "Novel ultrasound method to reposition kidney stones," Urol. Res., 38, 491-495, doi:10.1007/s00240-010-0319-9, 2010. The success of surgical management of lower pole stones is principally dependent on stone fragmentation and residual stone clearance. Choice of surgical method depends on stone size, yet all methods are subjected to post-surgical complications resulting from residual stone fragments. Here we present a novel method and device to reposition kidney stones using ultrasound radiation force delivered by focused ultrasound and guided by ultrasound imaging. The device couples a commercial imaging array with a focused annular array transducer. Feasibility of repositioning stones was investigated by implanting artificial and human stones into a kidney-mimicking phantom that simulated a lower pole and collecting system. During experiment, stones were located by ultrasound imaging and repositioned by delivering short bursts of focused ultrasound. Stone motion was concurrently monitored by fluoroscopy, ultrasound imaging, and video photography, from which displacement and velocity were estimated. Stones were seen to move immediately after delivering focused ultrasound and successfully repositioned from the lower pole to the collecting system. Estimated velocities were on the order of 1 cm/s. This in vitro study demonstrates a promising modality to facilitate spontaneous clearance of kidney stones and increased clearance of residual stone fragments after surgical management. Sorensen M.D., A.R. Shah, M.S. Canney, O.A. Sapozhnikov, J.M. Teichman, and M.R. Bailey, "Ureteroscopic ultrasound technology to size kidney stone fragments: Proof of principle using a miniaturized probe in a porcine model," J. Endourol., 24, 939-942, 2010. A prototype ultrasound-based probe for use in ureteroscopy was used for in vitro measurements of stone fragments in a porcine kidney. Fifteen human stones consisting of three different compositions were placed deep in the collecting system of a porcine kidney. A 2 MHz, 1.2 mm (3.6F) needle hydrophone was used to send and receive ultrasound pulses for stone sizing. Calculated stone thicknesses were compared with caliper measurements. Correlation between ultrasound-determined thickness and caliper measurements was excellent in all three stone types (r(2) = 0.90, p < 0.0001). All 15 ultrasound measurements were accurate to within 1 mm, and 10 measurements were accurate within 0.5 mm. A 3.6F ultrasound probe can be used to accurately size stone fragments to within 1 mm in a porcine kidney. Sorensen, M.D., J.M.H. Teichman, and M.R. 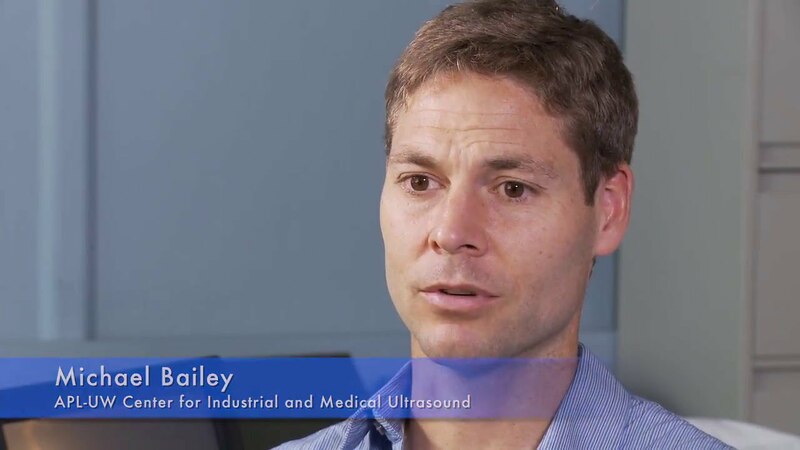 Bailey, "A proof of principle of a prototype ultrasound technology to size stone fragments during ureteroscopy," J. Endourol., 23, 1161-1164, 2009. PURPOSE: Proof-of-principle in vitro experiments evaluated a prototype ultrasound technology to size kidney stone fragments. MATERIALS AND METHODS: Nineteen human stones were measured using manual calipers. A 10-MHz, 1/8'' (10F) ultrasound transducer probe pinged each stone on a kidney tissue phantom submerged in water using two methods. In Method 1, the instrument was aligned such that the ultrasound pulse traveled through the stone. In Method 2, the instrument was aligned partially over the stone such that the ultrasound pulse traveled through water. RESULTS: For Method 1, the correlation between caliper- and ultrasound-determined stone size was r(2) = 0.71 (P < 0.0001). All but two stone measurements were accurate and precise to within 1 mm. For Method 2, the correlation was r(2) = 0.99 (P < 0.0001), and measurements were accurate and precise to within 0.25 mm. CONCLUSIONS: The prototype technology and either method measured stone size with good accuracy and precision. This technology may be possible to incorporate into ureteroscopy. J.C. Simon, B.W. Cunitz, O.A. Sapozhnikov, Y.-N. Wang, F. Starr, J. Thiel, J.R. Holm, M.D. Sorensen, and M.R. Bailey. Kidney stone detection in space with the color-Doppler ultrasound twinkling artifact. M. Bailey, B. Cunitz, B. Dunmire, P. May, O. Levy, H. Wessells, M. Sorensen, and J. Harper. Technology to reposition kidney stones with ultrasound. V.A. Khokhlova, P.V. Yuldashev, P.B. Rosnitskiy, A.D. Maxwell, W. Kreider, M.R. Bailey, and O.A. Sapozhnikov. Design of HIFU transducers to generate specific nonlinear ultrasound fields. J.C. Simon, B.W. Cunitz, J. Thiel, O.A. Sapozhnikov, J.R. Holm, B. Dunmire, M.D. Sorensen, and M.R. Bailey. Evidence for trapped bubbles as the cause for the color Doppler ultrasound twinkling artifact. A. Maxwell, W. Kreider, Y.-N. Wang, B. Cunitz, O. Sapozhnikov, M. Hubbard, B. Dunmire, M. Bailey, J. Harper, and M. Sorensen. Burst wave lithotripsy: A noninvasive method to fragment kidney stones with sinusoidal ultrasound pulses. B.W. Cunitz, A. Maxwell, B. Dunmire, B. MacConaghy, M.R. Bailey, O. Levy, J. Harper, and M. Sorensen. Prevention of renal stone complications in space exploration. M. Bruce, B. Cunitz, C.T. Darveau, J. Simon, B. Dunire, and M. Bailey. Observations of the Doppler twinkling artifact of kidney stones is bubble related. Barbrina Dunmire, Franklin Lee, Bryan Cunitz, Jonathan Harper, Mathew Sorensen, Marla Paun, and Michael Bailey. 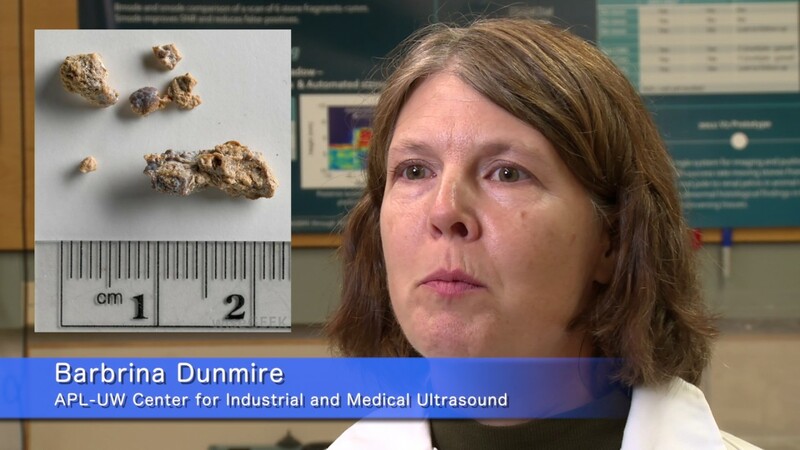 Using Ultrasound to determine the size of kidney stones. Michael Bailey, Franklin Lee, Bryan Cunitz, Barbrina Dunmire, Marla Paun, Susan Ross, James E. Lingeman, Michael Coburn, Hunter Wessells, Mathew Sorensen, and Jonathan Harper, Ultrasonic propulsion of kidney stones: Preliminary results from human feasibility study. Julianna C. Simon, Oleg A. Sapozhnikov, Vera A. Khokhlova, Yak-Nam Wang, Lawrence A. Crum, and Michael R. Bailey. The role of cavitation in the ultrasonic atomization of liquids and tissues. Oleg Sapozhnikov, Adam Maxwell, Wayne Kreider, and Michael Bailey. Solid particle transverse trapping at the focus of 1.5-MHz vortex beam radiated by 12-sector ultrasonic array. Bryan W. Cunitz, John C. Kucewicz, Barbrina Dunmire, Marla Paun, Ryan Hsi, Franklin Lee, Jonathan D. Harper, Mathew D. Sorensen, Oleg A. Sapozhnikov, and Michael R. Bailey. Real-time kidney stone detection using optimized Doppler imaging. Michael Bailey, Franklin Lee, Ryan Hsi, Marla Paun, Barbrina Dunmire, Ziyue Liu, Jonathan Harper, and Mathew Sorensen. Shockwave lithotripsy with renoprotective pause is associated with renovascular vasoconstriction in humans. Bryan W. Cunitz, John C. Kucewicz, Barbrina Dunmire, Marla Paun, Franklin Lee, Jonathan D. Harper, Mathew D. Sorensen, Oleg A. Sapozhnikov, and Michael R. Bailey. Optimization of Doppler ultrasound imaging to enhance real-time kidney stone detection. Barbrina Dunmire, Franklin Lee, Bryan Cunitz, Jonathan Harper, Mathew Sorensen, Marla Paun, and Michael Bailey. 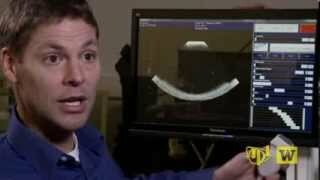 Ultrasonic sizing of kidney stones. Click on 2014 abstracts and search for APL-UW authors to read complete abstracts. George R. Schade, Adam D. Maxwell, Yak-Nam Wang, Tatiana D. Khokhlova, Daniel W. Lin, Oleg A. Sapozhnikov, Michael R. Bailey, and Vera A. Khokhlova. Pilot evaluation of boiling histotripsy of the kidney: Assessment in human ex vivo kidneys and validation of the porcine model. Jonathan Harper, Franklin Lee, Bryan Cunitz, Barbrina Dunmire, Marla Paun, Susan Ross, Michael Bailey, James E. Lingeman, Michael Coburn, Hunter Wessells, and Mathew Sorensen. Ultrasonic propulsion of kidney stones: Preliminary results from human feasibility study. Franklin C. Lee, Bryan Cunitz, Barbrina Dunmire, Mathew Sorensen, Jonathan Harper, and Michael Bailey. Novel automated stone detection system to measure renal calculi with ultrasound. Franklin C. Lee, Barbrina Dunmire, Jonathan Harper, Bryan Cunitz, Michael Bailey, and Mathew Sorensen. The acoustic shadow width is a more accurate predictor of true stone size during ultrasound. Franklin Lee, Ryan Hsi, Mathew Sorensen, Marla Paun, Barbrina Dunmire, Ziyue Liu, Michael Bailey, and Jonathan Harper. Shockwave lithotripsy with renoprotective pause is associated with renovascular vasoconstriction in humans. Julianna Simon, Oleg Sapozhnikov, Vera Khokhlova, Yak-Nam Wang, Wayne Kreider, Lawrence Crum, and Michael Bailey. The role of bubbles in the atomization of liquids and tissues. Franklin C. Lee, Barbrina Dunmire, Jonathan D. Harper, Bryan W. Cunitz, Marla Paun, Michael R. Bailey, and Mathew D. Sorensen, Ultrasound acoustic shadow width is an accurate predictor of kidney stone size. Julianna C. Simon, Oleg A. Sapozhnikov, Vera A. Khokhlova, Yak-Nam Wang, Lawrence A. Crum, and Michael Bailey. Ultrasonic atomization: A mechanism of tissue fractionation in boiling histotripsy. Yak-Nam Wang, Tatiana Khokhlova, Adam Maxwell, Wayne Kreider, Ari Partanen, Navid Farr, G. Schade, Michael Bailey, and Vera Khokhlova. Mechanical decellularization of tissue while sparing vascular structures using boiling histotripsy. Petr V. Yuldashev, Adam D. Maxwell, Wayne Kreider, Tatiana D. Khokhlova, Oleg A. Sapozhnikov, Michael R. Bailey, Lawrence A. Crum, and Vera A. Khokhlova. Acoustic field of a therapeutic transducer for generating boiling histotripsy lesions at significant depths in tissue: Combined measurement and modeling characterization. Franklin Chong-Ho Lee, Yak-Nam Wang, Barbrina Dunmire, Julianna C. Simon, H. Denny Liggitt, Marla Paun, Bryan W. Cunitz, Frank Starr, Michael R. Bailey, Kristina Penniston, Ryan S. Hsi, Mathew D. Sorensen, and Jonathan D. Harper. Preclinical safety and effectiveness studies of ultrasonic propulsion of kidney stones. J.C. Simon, O.A. Sapozhnikov, V.A. Khokhlova, Y.-N. Wang, L.A. Crum, and M.R. Bailey. Ultrasonic atomization of tissue: A mechanism for ultrasound-based surgery. Ryan S. Hsi, Barbrina Dunmire, Bryan W. Cunitz, Xuemei He, Mathew D. Sorensen, Jonathan D. Harper, Michael R. Bailey, and Thomas S. Lendvay. Content and face validation of a curriculum for ultrasonic propulsion of renal calculi in a human phantom. Ryan S. Hsi, Bryan W. Cunitz, Barbrina Dunmire, Marla Paun, Jonathan D. Harper, Michael R. Bailey, and Mathew D. Sorensen. Development of dedicated stone detection protocols using a research-based ultrasound imager. Vera A. Khokhlova, Yak-Nam Wang, Sergey V. Buravkov, Adam D. Maxwell, Tatiana D. Khokhlova, Daniel W. Lin, Oleg A. Sapozhnikov, Michael R. Bailey, and George R. Schade. Histological analysis of mechanically fractionation lesions generated in ex-vivo human and porcine kidneys using high intensity focused ultrasound. Russian Acoustical Conference, Moscow, October 2014. Michael Bailey, Bryan Cunitz, Barbrina Dunmire, Yak-Nam Wang, Adam Maxwell, Oleg Sapozhnikov, Jonathan Harper, Mathew Sorensen, Ryan Hsi, Franklin Lee, and Lawrence Crum. Stone specific ultrasound mode for the diagnoses and treatment of kidney stones in space. 85th Annual Scientific Meeting of the Aerospace Medical Association, 1115 May 2014, San Diego, CA. Franklin Lee, Jonathan Harper, Ryan Hsi, Marla Paun, Barbrina Dunmire, Bryan Cunitz, Michael Bailey, and Mathew Sorensen. Stone size measurement using the ultrasound acoustic shadow. 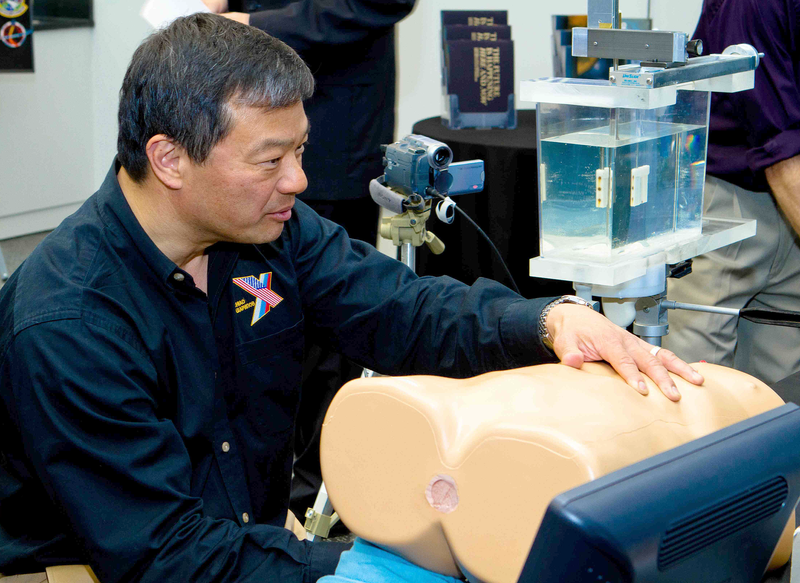 Northwest Urological Society Conference 67 December 2013, Vancouver, BC. Franklin Lee, Ryan Hsi, Mathew Sorensen, Marla Paun, Barbrina Dunmire, Ziyue Liu, Michael Bailey, and Jonathan Harper. Shock wave lithotripsy pause results in vasoconstriction and theoretical renal protection in humans. Northwest Urological Society Conference 67 December 2013, Vancouver, BC. Franklin Lee, Mathew D. Sorensen, Ryan S. Hsi, Barbrina Dunmire, Bryan W. Cunitz, Marla Paun, Michael R. Bailey, and Jonathan D. Harper. Development of automated kidney stone detection using a research-based ultrasound imager. Western Section American Urological Association Annual Meeting, 37 November 2013, Monterey, CA. Adam D. Maxwell, Bryan W. Cunitz, Wayne Kreider, Oleg A. Sapozhnikov, Ryan S. Hsi, Mathew D. Sorensen, Jonathan D. Harper, and Michael R. Bailey. Extracorporeal lithotripsy using ultrasound pulses without shock waves: In vitro results. Western Section American Urological Association Annual Meeting, 37 November 2013, Monterey, CA. A transducer is used to send an ultrasound pulse toward a stone and to receive ultrasound reflections from the stone. The recorded time between a pulse that is reflected from the proximal surface and a pulse that is reflected either from the distal surface of the stone or from a surface supporting the stone is used to calculate the stone size. The size of the stone is a function of the time between the two pulses and the speed of sound through the stone (or through the surrounding fluid if the second pulse was reflected by the surface supporting the stone). This technique is equally applicable to measure the size of other in vivo objects, including soft tissue masses, cysts, uterine fibroids, tumors, and polyps. During shock wave therapy, a determination is made that a kidney stone has begun to fracture, and then a progress of its fragmentation is assessed. This determination can reduce the number of shock waves used to disintegrate kidney stones, and thereby reduce dose-dependent tissue damage. The identification of fracture is possible through the detection and analysis of resonant acoustic scattering, which is the radiation caused by reverberations within a stone particle that is struck by a shock wave. 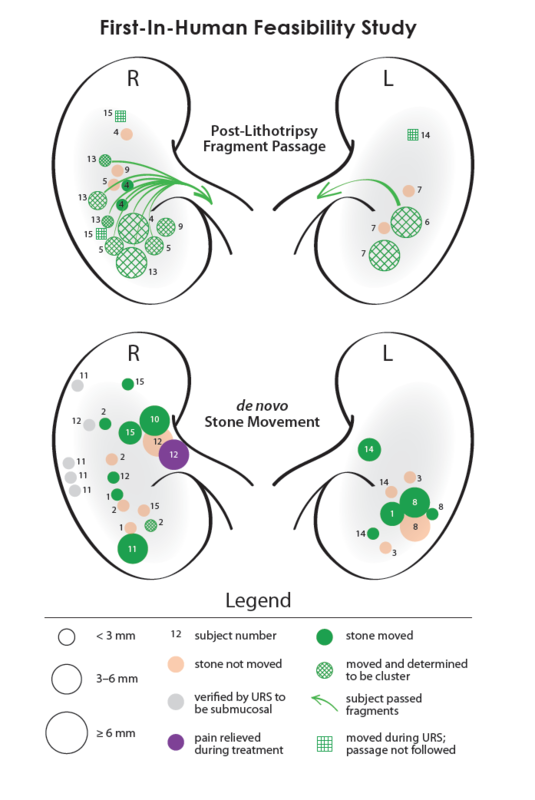 The scattering frequency can provide both an indication that the kidney stone has fragmented, and an indication of the relative sizes of the fragments. Such techniques can be combined with vibro-acoustography based gating that better targets the stone.